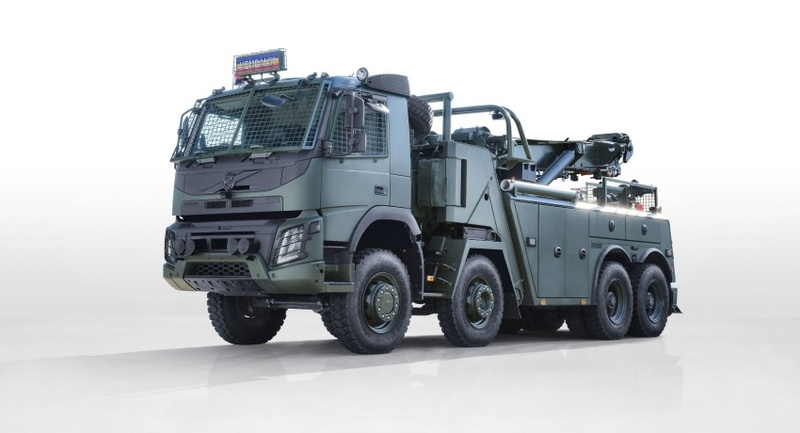 Volvo Group Australia has dispatched a shipment of specialised military vehicles to Malaysia, launching what it hopes will be a new export initiative for the company, for Queensland and for Australia. In a world-first export deal for Volvo in Australia, the team at the company’s headquarters in Wacol, Brisbane, took two years to plan and adapt the two civilian Volvo FMX trucks to meet the highly specific requirements of military heavy recovery vehicles. Vice president of state and federal sales at Volvo Group Australia, Jon Mclean, described the export as significant for Australian engineering and manufacturing, with the potential to be just the start of a new line of defence exports for Australia. "These vehicles are like nothing ever before produced here in Australia," Mclean said. Designed to operate off-road in demanding operational conditions, they can lift and tow the full range of military vehicles weighing up to 30 tonnes. Mclean and his team recently put the vehicles through their paces at testing facilities in Brisbane, before preparing them for shipping to Malaysia. "Volvo has a reputation in the truck industry around the world for its stringent testing, and I’m pleased to say these vehicles more than met these standards," Mclean explained. Volvo Group Australia is strategically placed to support the Commonwealth government’s Defence Export Strategy, which aims to position Australia as one of the world’s top 10 defence exporters by 2028. Currently, Australia’s defence exports total between $1.5 billion and $2.5 billion annually. Mclean said, "The government’s strategy identifies four priority market groups for defence exports and we are well-positioned to contribute to this growth, particularly in the Pacific region." The Volvo FMX is designed to be the ultimate truck for rough terrain. Its chassis has been designed to withstand the most demanding of driving conditions. And it’s been built to carry the heaviest loads. The robustness of the Volvo FMX makes military logistics assignments easier, safer and more resource- and cost-effective. It’s easily adapted to suit an individual mission’s requirements, and laden with innovative features. Volvo Group Australia is responsible for Mack, Renault, UD and Volvo truck brands within Australia, New Zealand, New Caledonia, Papua New Guinea and the south Pacific islands.